When you take on the task of building a Eurorack Case, one of the biggest obstacles is understanding the differences between the Eurorack Rails and the fixings required for each rail. 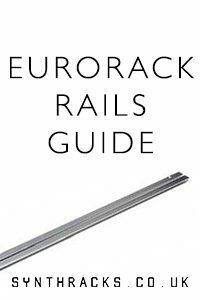 This article aims to provide details of the Eurorack Rails commonly available in the UK and Europe. We hope to clarify what screw sizes and nuts can be used, not only for securing the Eurorack modules to the rails but also, for fixing the rails to the case. Eurorack Rails are measured by their length in HP (HP as explained in the Horizontal Pitch blog), with 1 HP being 1/5 inch or 5.08mm. The Eurorack spacing standard between 2 rails is the distance of 3U, which is the equivalent of 5.25” or 133.35mm. Rail lengths can vary from case to case, and there is no set standard for this. One of the most frequently found sizes is the 84HP rail, this size allows for the addition of rack ears, which enable the rails to be attached to a standard 19” rack. Whilst the 84HP case is still prevalent there are many other sizes available. How the rails are fixed to the case can vary. The rails can either be held in position by machine screws fixed through the side of the case material and into the rail. The Eurorack Rail dimensions – on the right – would, therefore, give you the clear internal width of the case. 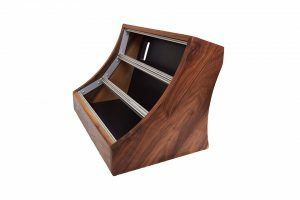 Alternatively, they can be secured by side panels or brackets and the thickness of these would need to be taken into consideration when determining the internal clear dimension of the case. If you are making the case yourself the pre-made and drilled side panels will provide a guide for your rails and will form a correctly sized 3U frame, making it easier to fix and correctly position the rails. Note: If you are building your own case, we strongly recommend that you acquire your Eurorack Rails first, ensuring a good fit between the sides of the case and to establish the position of the end fixing. We have found 6 types of Eurorack Rails used and available in Europe. All the rail options are slightly different, specifically on size and fixings required to fit modules to your rails, as well as fixing the rails to the case. 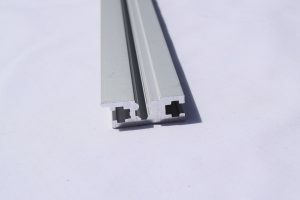 All the rail profiles are made from aluminium and can be found in use with sliding nuts or threaded rails into which small machine screws are used to secure the Eurorack Modules to the rail. The threaded rails or nuts are made to receive either M2.5 or M3 machine screws. If sliding nuts are used these should be square shaped rather than the more commonly available hexagonal headed, which easily get stuck. We have also included more of this conversation at the bottom of this article where we have added an illustration from Doepfer A100 construction details illustrating the mechanical sizes of the Eurorack face plate format. – Uses M2.5 square nuts, or threaded rail tapped to M2.5. The threaded rails tapped to M3 we have in stock fit the Vector Rails. -You will need M2.5 x 6mm to fix the modules or M2.5 x 8mm if a washer is used. -The rails can be end fixed using M5 machine screws, although, being of US origin the stated size is 10-32inch. -The Vector Rails have no lip and there is a cutout slot that allows a nut to be inserted into the rail (strut) recess after it is fixed to the case. This is not possible on the other rails mentioned, which require nuts to be inserted prior to fixing to the side panel or case. Anodised aluminium. Uses M3 square nuts or threaded rails. The M3 threaded rails that can be used with GieTec rails will also work with these.SynthRacks Eurorack rails have been specifically designed and manufactured to work with Eurorack cases. SynthRacks Eurorack Rails, have been specifically designed and manufactured to work with Eurorack cases. They are unique as they have two different faces. One side has a lip, the other side resembles the Vector rails and has no lip, both faces are suitable for use in Eurorack cases. The end fixing centre for securing the rail to the case is compatible with cases made to receive GieTec rails as in Doepfer case designs and are fixed with M5 machine screws. These are available in the following sizes 60HP, 84HP, 104HP, 110HP, 126HP, 168HP – other custom sizes can be cut to suit. These rails are found in Doepfer’s Eurorack Cases and are likely to have been instrumental in establishing the Eurorack module physical format. -The rails take M3 square nuts or threaded rails. -A suitable size of machine screw to fix the modules to the rail (assuming a modular face plate thickness of 2mm) is an M3 x 6mm or M3 x 8mm if a washer is used. -For the end fixing, use an M5 machine screw. Gie-Tec also manufactures a variation of this rail without the lip, however, the reduced thickness and fixing geometry do not make it suitable for the Eurorack format. -The Schroff rails are similar to the Gie-Tec Rail in that they have a lip, however, they are constructed to accepts M2.5 nuts. The threaded rail supplied by the manufacture of the rails is also tapped to M2.5 although they also manufacture an M3 tapped threaded rail to fit. -The housing for the nut is recessed deeper than the Gie-Tec Rail and you will need M2.5x 8mm to fix the modules or M2.5 x 10mm if a washer is used. -For the end fixing use M4 machine screw. We have noted that the M3 threaded rail fit and is usable in the Schroff Rail and shall be investigating in the future if other manufacturers M3 tapped threaded rails will work. Illustration show one type of Schroff Rail, they have a different rail with an alternative profile but they should work OK with the Eurorack format. The recess depth remains as above, so will still requiring similar lengths of screws to fix the Eurorack synthesiser modules. We have not been able to find out a great deal of info on these rails, but it would appear that they are Anodised Aluminium and from the drawing, it can be assumed that the end fixing is M4 and that you would have to use M2.5mm nuts or suitable threaded bar. -The rails are made of anodised aluminium natural finish or black. -Uses M3 tapped threaded rails or M3 square sliding nuts. -Dimensions of the rail indicate that they will accept 6mm or 8mm long screw without grounding. Use 8mm or 10mm long machine screw if using a washer to fix the Eurorack module into position. -The end fixing of the Tiptop Audio rail needs an M4 machine screw to secure it to the case or side panels. To date, I have not been able to check if other manufactures threaded rails will function OK with the TipTop Rails. If you look at the geometry of the profile in conjunction with the mechanical dimensions of the Eurorack format, the centre of the recess does not appear to line up with the 3u 19” rack height. It may be that the case manufacturers are compensating for this in a small way, and/or the M2.5 module fixing screws, together with the elongated fixing holes on the module faceplates, give sufficient tolerance so as not to be a problem. Anyway, there are plenty of cases out there (understatement) with Vector Rails being used very successfully …so I guess the answer is, who cares! “Basically ALL rails will work on custom cases because you set the distances between the rails based on the hole to hole spacing of 122.5mm. the lip is a cosmetic addition and if the panels are made correctly, being 128.5mm tall with the holes 3mm in from the tops and bottoms, then it will work. With Vector and other non-lipped rails , this will leave a small gap beyond the panel, but they will still work. The “U” rack spec is 1.75″ (44.45mm) per 1U so the standard Eurorack 3U height to fit in a standard rack system would be 5.25″ (133.35mm) so you can see that the standard Doepfer sized front panel has 10.85mm (a little over .4″) left over. this is filled with a lip on the rails that have them, and with air in the ones that don’t. On a Vector rail system, the rack ears are slotted and the rails can be adjusted but if you are making your own cabinet, this doesn’t matter at all unless you want to rack mount the cabinet. I have made rack mounted and non-rack mounted cabinets and skiffs using Vector rails and it has never been a problem. On a rack system, you will have gaps between the vector Eurorack and the next piece of standard rack gear but this will happen with rack gear anyway. The MOST important dimension, no matter what rails you use, is the slot centre to slot centre dimension. This should be 122.5mm (4.82″) or you won’t be able to mount the panels. The recent problem with 1U tiles not fitting the intellejel new cabinet is that the original makers of the tiles use the standard rack spacing of 1.75″ and used non-lipped rails. Thusly the centers of the slots were farther apart than that would have been if lipped rails were used. Intellijel used lipped rails in the same 1U dimensions and because of that, none of the current 1U tiles will fit in his unit, and none of his 1U modules will fit in the current 1U tile cabinets. Synthwerks is a proud member of the Mostly Modular Trade Association (http://www.mostlymodular.com). If you have further information on alternative rails available, have additional info on the rails listed here or believe any information to be wrong – we shall be delighted to hear from you. Please email, info@synthracks.com and we shall update this page accordingly. ps – as nifty as it is – the submit button was hidden for these comments and I had to guess where it was – you may be missing out on some nice words by not having it static visually. Thanks Kev for the feedback and I’m glad you found the site useful. Also thanks for the heads up on the submit button – I will get the web admin to take a look. hey i bought a old ammunition box with outher dimensions 30 x 15 x 18 cm. kinda thin metal. could i use this to build a rack and how and what parts should i best use for this . Email me at info@synthracks.com if you wish to go further with this. The clear internal dimension of the box (in mm ) would be required for me to make a frame up for you. Very interesting run down, something I’ve wondered about for a while. Just received my 19″ rack mount and congratulations on how well it was packaged. Many thanks. Thank you. Happy to hear that your frame has arrived safely. 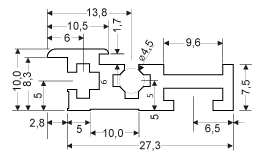 im currently building a case using doepfer-style rails (GIE-TEC), and i find it super weird that I’m supposed to screw a 5mm scren in a 4.5 mm hole on the endsides. thats destructive and id like to avoid that in order to be able to re-use the rails in a next build. ill probably use a threaded shaft instead.